Download YouTube videos (MP4, FLV, and Webm), YouTube HD videos(even 1080p, 4K videos) and 3D videos and convert to MP3, AVI, MKV, WMV, MOV, etc. Convert various videos on your Mac to other popular formats. 4Media YouTube Video Converter for Mac is compatible with the latest YouTube upgrade. With 4Media YouTube Video Converter for Mac, you can easily download your favorite YouTube HD videos(even 1080p and 4K videos) and 3D videos to Mac and convert them to various popular videos in one-step like MP3, AVI, MP4, MKV, WMV, WAV, MPG, MOV, M4A, FLAC and FLV for enjoying them offline on multiple devices , such as, iPod, iPhone, iPad, Samsung Galaxy, Kindle Fire, Nexus, Surface Pro, Moto X, HTC One, Nokia Lumia, etc. Moreover, this Mac YouTube Video Converter owns the facilitated features like downloading YouTube videos by pasting URL, customizing downloaded formats and parameters and converting YouTube videos /local videos to various formats. It allows users to directly transfer MP4/ MOV/MP3 files to iTunes with preferred setting. 4Media YouTube Video Converter for Mac is just the one you need for enjoying multimedia. A totally free YouTube video downloader helps you download YouTube videos and YouTube HD videos (even 1080p, 4K videos) and 3D videos to Mac with fast downloading speed. Convert the downloaded YouTube videos and local videos to popular videos formats in just one-step, such as MP3, AVI, MP4, MKV, WMV, WAV, MPG, MOV, M4A, FLAC and FLV for playback on multiple digital devices. Download and convert multiple YouTube videos at a time with fast downloading and converting speed. Convert YouTube videos to various formats for playing them on multiple devices, such as, iPod, iPhone, iPad, Samsung Galaxy, Kindle Fire, Nexus, Surface Pro, Moto X, HTC One, Nokia Lumia. Support converting to various devices: iPod, iPhone, iPad, Samsung Galaxy, Kindle Fire, Nexus, Surface Pro, Moto X, HTC One, Nokia Lumia. After set the desired format, YouTube Video Converter allows you to download and convert videos simultaneously. Provide a simple way of downloading. Just by pasting the URL of a certain video, user can easily finish the downloading task. The YouTube Video Converter for Mac enables you to choose whether you need to automatically transfer MP4/ MOV/MP3 files to iTunes or not. It is capable of not only downloading YouTube SD videos, but also HD vides (even1080p, 4K videos) and 3D videos. 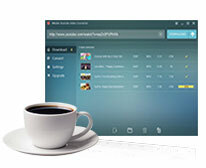 And it is able to convert local videos to any popular formats. By applying the multithread technology to the software, users can download and convert videos in batch, saving much time and efforts. The ability of automatic and regular check for updates ensures your software in the latest version. The Mac YouTube video converter is available in English, German, Spanish, Japanese, French and Chinese.